It's been a stormy, gray week or so in my part of the country, with a hurricane followed by a nor'easter, and I'm suddenly in the mood for some natural floral perfumes — the closest I can get to wearing actual flowers. I've just tried two scents from indie natural line Aftelier, both in Eau de Parfum formulation. The newer one (just released) is Wild Roses, which "evokes the garden in our imagination and memory — the book of a hundred petals unfolding: balsamic, spicy, apricot, and honeyed roses, mixed with the smell of warm earth and herbs." Wild Roses' composition includes top notes of rose CO2, heliotropin, bergamot, geraniol, m-methyl anthranilate and damascenone; a heart of apricot, Turkish rose absolute, pimento berry, p-ethyl alcohol and rose petals attar; and a base of tarragon absolute, vanilla absolute, indole and aged patchouli. It really does deserve its name: Wild Roses is most definitely not a dainty tea-rose fragrance. It starts off boldly, with emphatic spicy and woody notes that put me in mind of a very sophisticated pomander or potpourri. The earthiness of the spice and woods, and the mystery of an incense-like note, are balanced by a hint of bright bergamot. After an hour or so, Wild Roses turns more rounded and velvety. The apricot note is there, but the heart of the fragrance is more like a fruity wine than an actual piece of fruit. The rose center is lush and true. The pimento berry, also known as "allspice," keeps things piquant; there's some vanilla in the dry down, long after Wild Roses has been applied, but it stays in the background. Wild Roses has much more endurance on my skin than some other Aftelier fragrances. (I'm thinking of Lumière, for example; I like it, but it doesn't last long on me.) I'm tempted to call it the younger, hippie cousin of Nahéma; in any case, it has far more personality and depth than most of the mainstream rose-patchouli fragrances on the market today. On the other hand, if you're not a rose-lover (!) but you're in the mood for a soft, natural-smelling floral, Honey Blossom might catch your fancy. The Aftelier website describes Honey Blossom (released in late 2010) as a "beautiful honeyed floral, hypnotic with notes of honeysuckle" — more specifically, top notes of mimosa and linden blossom CO2; heart notes of orange blossom absolute and phenyl ethyl alcohol; and base notes of ambergris and benzoin. Honey Blossom starts off grassy and golden-green, with top notes that remind me of hay and broom. They're followed by a dusty-sweet mimosa and then a very soft vanillic honey note. However, Honey Blossom always remains more floral than gourmand. Although the official description mentions honeysuckle, this scent reminds me more of clover flowers, which are indeed "honey blossoms"! If you're looking for a botanical-based alternative to L'Artisan Parfumeur Mimosa Pour Moi or Caron Farnesiana, Honey Blossom may very well please you. It isn't as long-lasting as Wild Roses, but it ekes out a very decent three or four hours on my skin. Both Wild Roses and Honey Blossom are fragrances that I would wear often, albeit in very different moods. They're more "me" than any Aftelier fragrances I've previously tried, but they're also typical Aftelier products in the high standard they set for natural perfumery. Aftelier Wild Roses and Honey Blossom are available as Eau de Parfum (30 ml for $170) and Perfume (8 ml for $170; 2 ml for $50). Samples are also offered. 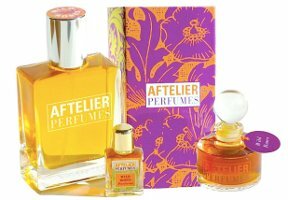 For purchasing information, see the listing for Aftelier under Perfume Houses. I wish Wild Roses had been available when I placed my order for a bunch of Aftelier samples recently. I especially am intrigued by your statement about its longevity, as this is a real issue for me with most perfumes, and especially natural perfumes. So far my favorite Aftelier is Secret Garden, and there is probably a FB in my future soon. Now, if I can just decide between the extrait and the EdP. Wonderful review, Jessica. I love a rose/patchouli combination, especially aged patchouli. And your description of this as “a younger, hippie cousin of Nahema” really has me intrigued! I love that combination, too — at least, I used to, until the concept got overdone and there didn’t seem to be much rose *or* patch in fragrances that supposedly had it! And this one isn’t just rose and patchouli — the allspice is really striking, and something about the mix of fruit notes plus rose plus benzoin is dreamy. Agree! And I’m *not* a fan of neutered patchouli! Can you tell I’m an old hippie? I like “old hippies,” being a no-longer-young, semi-bohemian type myself! I like real patchouli too, and I’m not a hippie or a Bohemian, I just like real things. I got interested in aromatherapy about 15 years ago, and so my experience with patchouli is with the whole essential oil, not some sanitized fraction of it or some synthetic partial reconstruction. I can’t even recognize the “patchouli” note in most of the perfumes that claim to contain it. L. – I didn’t realize that we had aromatherapy in common. I’ve practiced therapeutic aromatherapy for about 20 years now. What is your preferred brand of oils? Oh, I not an aromatherapist or anything. I just got interested in it and played around with it for my own use and for my husband, mostly in baths or in potpourri pots or room sprays. I tried blending perfumes, but was quite limited in my palette since I couldn’t afford (or even find) the very expensive oils such as jasmine or rose. I enjoyed finding out how various essential oils could help to wake me up, relax me, or whatever. It was also quite an eye-opener for me to find out just how complex and multi-faceted natural essences are in comparison to the synthetic substitutes that are so prevalent today. It would really annoy me to see some cheap drugstore or grocery store product with the work “aromatherapy” plastered all over the label, and find from the ingredients list that it contained little or no natural essential oils. I don’t have experience with many different brands; since I had no such thing as internet access until just a couple of years ago, I had to buy what I could find at the stores in my area, mostly Aura Cacia. Now that I do have internet access, of course, I could no doubt have a wider range of choices. Is there a brand you prefer? Wild Roses sounds great to me, the patchouli and the apricot note have me curious. Floral and sweet with incense and patchouli. Yum! Exactly! It’s a many-faceted rose. Well worth a try! They are! I hope you’ll have a chance to try them. I’ve tried five or six of the Aftelier fragrances. Not one of them lasted more than thirty minutes, so I certainly won’t be trying these latest compositions. Oh, it’s a shame they didn’t last on you. I don’t usually get much wear out of botanical/natural perfumes, but I’m happy with the longevity of these two. Thank you Jessica – what a treat to get two wonderful reviews! I really appreciate the way you evoke these two very different florals with your talented writing. Thanks, Mandy! Glad you enjoyed it! Jinx! I just put up a post with a little piece on Mandy’s beautiful Honey Blossom and then discovered you’d written about it as well today. I totally agree with you about the clover, Jess, though for me it’s a field of bluebonnets in the sun. Definitely a living, green, dusty honeyed scent that I never thought I’d find in a bottle. I bought it for myself for my 41st birthday. Can’t wait to try Wild Roses! That is so funny! I just went to read your post, since I didn’t spot it earlier. I’ve never smelled Texas bluebonnets, but I love the way they look! I really like the Honey Blossom. When I first dabbed it on I thought it was disgustingly sweet, however, the next day I tried it again and couldn’t stop sniffing. Hi, Curly — I like the fact that it’s not too sweet, even though it has “honey” in the name! I don’t wear as many gourmand scents as I used to. These sound lovely. Now I need to place a sample order. Hajusuuri, I’m so glad Aftelier offers samples. You definitely get enough for several uses, too. Took a class with Mandy once. Super sweet, very talented. I personally love Cepes & Tuberose. Interesting spin on Tuberose. Oh, lucky you! Cepes & Tuberose isn’t “me” (I don’t wear much tuberose, in any case), but I admire it. The same goes for Pink Lotus. Ooh. I want to know more about the class. I’m currently doing the first workbook with the fragrance kit. Depending on how I feel about the home study, I may take the advanced and/or the studio class. I haven’t tried Wild Roses yet (but, of course, now, after your review, I want to ) and I really like Honey Blossom, it’s one of my favorite sleep scents. I was wearing it on a weekend and I took a nap — it was lovely to wake up and smell the scent still on my skin! It is a really comforting fragrance! I love orange blossom, too. If I adore Lady Vengeance (Juliette Has A Gun by R. Ricci) would I also be drawn to Aftelier Wild Roses?